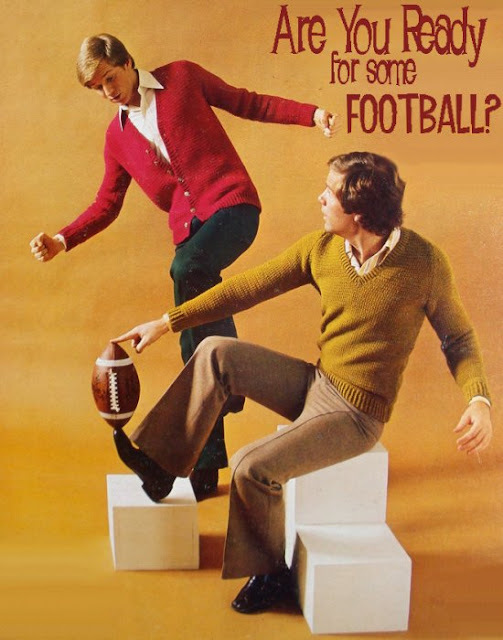 Retrospace: Are You Ready for Some Football? I've been following baseball since I was an 8 year old who loved Charlie Hustle. I could probably name the lineup of every team and their position and collected baseball cards to boot. Over the years, I've developed a loyalty to the Atlanta Braves, since I had to live all over the country, TBS was always there to show the Bravos (usually losing horribly). My father is a die-hard Yankees fan, born and raised in NYC and took the subway to see Mickey Mantle play on a daily basis. I also enjoy college football. Every Saturday you'll find me rooting for my alma mater, Auburn University with the kids. War Eagle, baby. College football fits perfectly with my obsession with all things retro - there's simply so much history associated with these teams; I find the history and century-old rivalries add an extra dimension to the game. How can you not enjoy watching the Alabama-Auburn game? Or the Kansas-Nebraska game, or Oklahoma-Texas? When Michael Jordan was still playing basketball, I watched every single Chicago Bulls game without fail. I feel that same sort of energy watching Lebron James. He has revitalized the NBA for me the past few years, and now there's yet another sport taking up my time in the evenings. One wonders how I find the time with a house full of kids and an 8-5 job to watch all these retro movies and TV shows, plus blog religously each day AND watch sports. To be honest, I can usually compose a post in under an hour, it's therapeutic and relaxing, and I always make time for it, even if it's late, late at night. Sleep is overrated. 1. Other sites have speculated that sports fans simply don't have the time, since they are too busy following their passion - watching sports. I don't buy this theory at all. What about all these movie blogs? Somehow they find the time to both write about and watch movies. 2. I've also read that blogging is the domain of computer literate individuals (i.e. nerds who'd rather sit behind a computer than go to the gym). I would also disagree with this. I've gotten to know (albeit rather indirectly) a lot of other bloggers - I see what a lot of them look like, what they're doing on weekends, what their likes and dislikes are, etc. What I don't see is a lot of homely looking nerds living in their parent's basement. What I do see is a lot of witty, socially active, and interesting individuals who live an enriched life. Sure, there's some overweight socially maladjusted bloggers out there who are rolling the 20 sided die right at this very moment and haven't seen the inside of a gym since they were getting hit in the nuts at dodgeball in eighth grade. But these are the minorty. So, what's my explanation? Well, if you scout around Flickr, Tumblr or any of the millions of blogs out there, you will find a helluva lot more images and information about topics like 1970's giallo films, Star Wars trading cards, and vintage funk albums than you will about any given sports topic. The bizarre, the rare, the odd, the vintage, the shocking, the fringe have found a collective home in the blogosphere (BTW I hate that effing word); it has become the haven for things not necessarily commercial or mainstream. It's global, so not limited to American interests, and it's largely driven by the younger generation. Just as the right wing _________ (insert word here) have found their niche on daytime talk radio, the offbeat has found its niche in the blogosphere. Sports already has its venue on TV, at the stadium, and on the radio.... what's the point of finding a voice through a blog? However, subjects such as Golden Age comics, Star Trek ephemera, horror paperbacks, and vintage lounge music records didn't have a venue before blogging (except in the form of hard to find magazines). Now they do.... and it's like the floodgates have been opened. And that's my explanation. What's yours? Another good post. I'm from one of the great locales for college football. Lincoln, Nebraska. Like the nice shaped rear end says, we are all about football. But, there is a huge amount of sports information out there, long before blogging started. Our sports section in the morning paper is quite large for the amount of actual sports news in it. We have several 24 hour sports networks. There just may be too much information competing for the sports fan's attention. Many of the sports blogs I've seen are just people hurling insults at each other. Think I'll stick with ESPN. How about sports card blogging? Although I feature other interests in my blog, I mainly blog about baseball cards. When I started doing this in March of 2008, there were only a handful of baseball card blogs. Now, I'd say, there are hundreds. Too many to follow. I don't have much of a theory about why only 10% of blogs are associated with sports. My theory is that there must be 10s or 100s of thousands of things that people blog about and that 10% of blogs devoted to one subject sounds like a lot. Also, I'm pretty sure that I read somewhere that most bloggers are on an ego trip (present company excluded perhaps) so they want to blog about themselves. My blog is about my collections of stuff, so I fall into that category. Blogging about what other people are doing doesn't have that ego satisfying kick to it. If you did this survey of the sports blogging scene, say, three years ago, I venture that you would've turned up more independent sports blogs. Sports blogging has gone corporate in an incredibly brief space of time. At first, there were a bunch of wonderful, independent blogs: the Mighty MJD, One More Dying Quail, Can't Stop the Bleeding, the Mid-Majority, Fire Joe Morgan, Free Darko, Mr Irrelevant, etc. Then Deadspin came on the scene and kinda changed the game, for better *and* worse. They legitimized the blogging form somewhat (even as they antagonized the traditional media outlets). They even provided a jumping off platform for new blogs that have become wildly successful: Kissing Suzy Kolber, With Leather, Walkoff Walk to name a few. Many of the independent bloggers were snapped up by AOL and Yahoo (and now SB Nation and Bloguin) in their attempts to create a sort of corporate sports blogging structure. The brothers Chris and Jamie Mottram had a *huge* hand in building both the AOL FanHouse with Yahoo's networks of ridiculously popular sports blogs (Shutdown Corner, Puckdaddy, Big League Stew, Dr Saturday). And, of course, there's the corporations going corporate. ESPN snapping up Henry Abbott's True Hoop site and the Football Outsiders. Sports Illustrated's partnership with Cold Hard Football Facts. Sporting News collecting Bethlehem Shoals from Free Darko and photoshopper extraordinaire LSUFreek. NBC Universal recently partnered with ProFootballTalk, one of the most influential rumor sites in all of sports. So yeah the revolutioned has been monetized, much like elsewhere on the web... but in a much more complete fashion. There are great independent voices out there in sports blogging. The Mid-Majority is still doing their thing. Ron Bellamy's Underachieving All-Stars, a Sports Scribe, Straight Bangin', Pitchers & Poets, Sport Is a TV Show, the Run of Play, the Starting Five, etc etc). But the y are harder and harder to find. I think your explanation makes sense, Gilligan. What need is there for a blog about a subject that's dissected on every nightly newscast, has its own section of the paper, several magazines, and five thousand sports channels?